Total Basement Finishing, the world’s leader in long lasting, waterproof basement finishing solutions introduces a brand new concept in basement floor decking: the new ThermalDry Insulated Floor Decking – a superior alternative to conventional wood decking for finished basement flooring underlayment. When it comes to finishing basement floors, it is never a good idea to lay the flooring directly against the concrete. The slab is a hard, cold, humid and unforgiving surface and most types of flooring laid on top of it will be uncomfortable. For that reason the typical contractor will build a subfloor or decking to raise the finished floor from the slab using 2 x 4s and plywood. In this video, Larry Janesky, owner and founder of Total Basement Finishing explains why wood decking is not the best option for finished basement floors, and how ThermalDry Insulated Floor Decking outperforms conventional wooden floors. As Larry reminds us, concrete lays on top of wet soil moisture from the ground migrates through the porous slab. The problem with conventional wood decking is that it will prevent that moisture from evaporating into the basement. Moisture will build up under the plywood and, since wood is organic and tends to soak up water, mold will start to grow. The basement will smell musty and the entire subfloor will eventually rot. Likewise, if water comes from a pipe, washing machine hose, water heater leak, or from any water related accident like a running faucet or clogged drain, that wood decking will also soak up water, grow mold and rot. 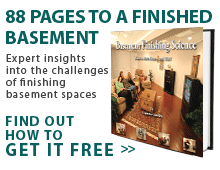 At Total Basement Finishing, we specialize in developing products that can withstand the harshest basement flooring conditions – even basement flooding – based on more than 20 years of experience solving basement related problems. Just like our basement wall systems, and finished basement flooring products, the patent-pending ThermalDry Insulated Floor Decking will not get ruined by water, or grow mold. A magnesium oxide board provides a sturdy and waterproof walking surface, ready to receive carpet, our MillCreek laminates and many other types of flooring. A 1-inch, graphite-infused SilverGlo insulation board, raises the surface from the cold floor, provides thermal and moisture protection.